The Irish white-tailed eagle reintroduction project has received a much-needed boost with news that five pairs, spanning four Irish counties, now have chicks in the nest. According to a press release issued by the Golden Eagle Trust, of the eight pairs that attempted to breed this year, eagle chicks have now hatched at sites in Glengarriff, West Cork; two sites in Co. Kerry; Mountshannon, Co. Clare and a new nest site in Galway. Three other breeding attempts in Co. Kerry were unsuccessful this year, but that is often be the case with first-time white-tailed eagle parents, and the initial attempt to breed is a positive first step. The first chick hatched in Glengarriff, Co. Cork in mid April, and is now around 7 weeks old. It is expected to fledge, all being well, some time in early July. The West Cork chick was followed by a chick hatched on Lough Derg near Mountshannon, Co. Clare, to the parents who successfully reared chicks in 2013 and 2014. A pair pair of eagles in Killarney National Park hatched a chick in early may, followed by chicks hatching in Galway and at another site in Kerry for the first time. Hopes are high that these five pairs will successfully fledge young this year — which would see the first eagle chicks born in Co. Cork, Co. Kerry and Co. Galway take to the skies. “We are delighted that white-tailed eagles are now nesting and hatching chicks successfully for the first time across four counties”, said Dr. Allan Mee, project manager for the Golden Eagle Trust. “In 2013 we had our first chicks reared in the wild in Clare, but this year we are excited to see that pairs are nesting as far away as Galway, although Kerry remains the stronghold for the species. In Scotland white-tailed eagles breeding as a results of a similar reintroduction project are estimated to bring in an additional £5 million to the local economy of the Isle of Mull annually, and almost a quarter of all visitors to the island come because of the eagles. Here in Ireland the positive impact of white-tailed eagles at a local level is already being experienced at Mountshannon, Co. Clare. During the summer of 2014 some 10,000 people visited to view the breeding eagles. A visitor survey found that white-tailed eagles were the primary reason for visiting Mountshannon for 43% of those surveyed, most (55%) said they stayed in the local area while visiting and the overwhelming majority (89%) said they would come back to see the birds in the future. 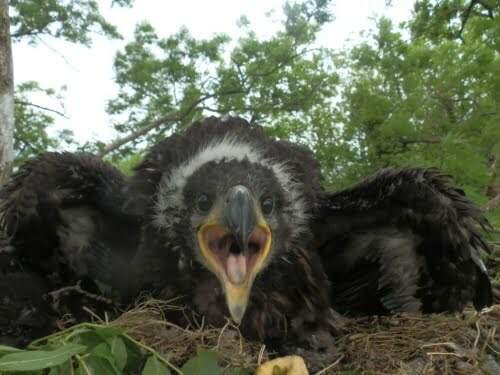 News of nesting white-tailed eagles with chicks is generating a lot of excitement locally in East Clare, West Cork, Galway and Kerry, and it’s only natural that people will want to get out to see the birds. However, the eagles are particularly prone to disturbance, particularly during the early stages of nesting when the birds are sitting on eggs or have small chicks in the nest. Dr Mee advises people not to approach nest sites, but to watch from a distance — and encourages people to take advantage of vantage points like Mountshannon pier, that provide good views of the birds at a safe distance. The visitor viewing facility at Mountshannon also provides information on the birds, their ecology and conservation. White-tailed eagles can live for 25-30 years and generally mate for life, with adult pairs remaining within their home range throughout the year. First time breeders, especially young birds, often fail at their first attempt. However, with the goodwill and support of local communities signs are promising that the species will have a bright future in Ireland. Fantastic. Good news for a chance. Let us all hope and pray nothing happens to them or the parents. Any word on Golden Eagle hatchings.